Video of a Cessna Citation Mustang (CE-510) takeoff and departure from Chicago Midway Airport. The video ends with a landing at Columbia Regional Airport and shows the extension of the speed brakes on the wing at touchdown. The speed brakes are activated by the flying pilot who toggles a switch on the throttles to extend the panels and spoil lift. This helps the aircraft settle more firmly on the runway for maximum braking. The Cessna Mustang is an easy to fly fuel efficient personal jet that can be flown single pilot or with a crew. It has Two FADEC (Full Authority Digital Engine Control) equipped Pratt & Whitney Canada PW615F engines that produce 1,460 pounds of takeoff thrust each. Setting power with the FADEC controlled engines is simple. Smoothly push the throttles up to the takeoff detent and leave them there till you’re ready to set climb power. After takeoff just pull the throttles back to the climb detent and the FADEC sets the appropriate power for the climb conditions. The cockpit instrument panel is dominated by 3 large monitors. These panels are at the heart of the impressive Garmin G1000 avionics suite. The Garmin 1000 brings a host of pilot friendly work load reducing features to the single pilot cockpit. One example is the airport diagram that can be displayed on the center multifunction display. This is great for night operations at unfamiliar airports. The solo pilot can monitor his taxi route to and from the active runway on this large beautifully lit monitor. 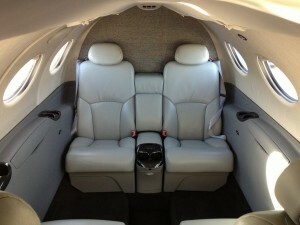 The mustang has six seats including the crew seats and ample baggage space. The nose baggage compartment can hold a maximum of 320 lbs. and the tail baggage compartment a maximum of 300 lbs. Considered a very light jet (VLJ) it has a max ramp weight of 8,730 lbs and a maximum landing weight of 8,000 lbs.it’s max service ceiling is 41,000 ft and its flight plan speed is 340 kts. The fuel system holds a maximum of 2,580 lbs of fuel and a flight planning rule of thumb for fuel burn is 1st hour 700 lbs, 2nd hour 600 lbs, 3 rd hour 500 lbs. This entry was posted in Cessna Citation, cou and tagged ce510, cessna 510, cessna citation mustang, cessna mustang, citation 510, citation mustang interior, cockpit voew, cou, garmin g1000, mdw, mustang landing, pw615f, single pilot, vlj on January 15, 2013 by James Sorsby.